Mitral Stenosis: This is mainly due to rheumatic or post-inflammatory disease. Rarely congenital stenosis may occur. Rheumatic Mitral Valve: This has diffuse thickening of each leaflet with calcified deposits particularly at the edges of the leaflets and fusion of both commissures. The chordae tendineae are also thickened, shortened and fused, adding to the stenosis and forming a parachute valve. Mitral Incompetence: In contrast to stenosis, the causes for this are multiple. This can be approached from the structure of the valve itself, the leaflet, chordae, papillary muscle and annulus. 1. Valve: Floppy ; Rheumatic ; Post-inflammatory ; Endocarditis. 2. Chordae: Floppy ; Idiopathic ; Endocarditis. 3. Papillary muscle: Myocardial infarction ; Hypereosinophilic syndrome; Fibroelastosis ; Endomyocardial fibrosis. These are degenerative, non-inflammatory calcific deposits within the annulus, usually in the elderly persons. There is regurgitation due to inadequate contraction of mitral valve ring during systole and inability of the leaflets to open during diastole. There may be arrhythmias due to involvement of conducting system by calcific deposits. Rarely, they are the focus of infective endocarditis. One or both mitral valve leaflets are enlarged, myxomatous and floppy and they prolapse into the left atrium during systole causing midsystolic click and mitral valve insufficiency. The disease occurs in the age group of 20 to 40 years and may be due to developmental anomaly affecting connective tissues (as it is common in Marfan syndrome). Clinical presentation : This is usually asymptomatic and discovered only as a midsystolic click on auscultation. It may be associated with atypical chest pain, dyspnea, fatigue or psychiatric symptoms like depression, anxiety etc. Patients have an increased risk of infective endocarditis, congestive heart failure, arrhythmias and sudden death. Gross: Most commonly the posterior leaflet or both the valve leaflets can be involved. Valve tissue is increased with the leaflets being larger, thicker and spongy in consistency. There is often ballooning of the leaflet tissue between the attachment of the chordae. Hooding, redundancy or prolapse are terms applied to the valve appearance. The chordae are also thickened, elongated and may rupture, so careful examination of the chordae and papillary muscles must be made in floppy valve diease. Often the valve is repaired with removal of part of the redundant valve tissue and sutured to restore competence. Microscopic features: There is thinning and degeneration of the fibrosa layer (on which the strength of the leaflet depends), and myxomatous thickening of the spongiosa. Similar changes can be seen in the chordae. i) Fibrous thickening of valve leaflets especially at the point of contact. 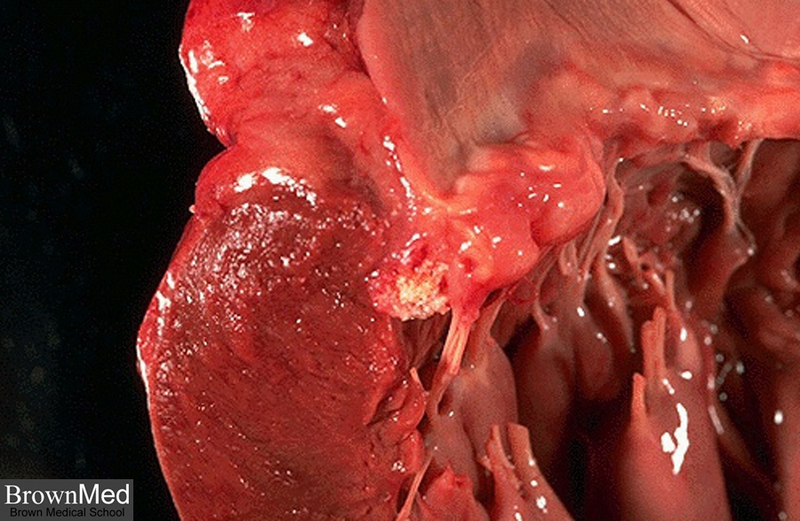 ii) Thickened left ventricular endocardium at sites of friction from the prolapsed leaflets or elongated chordae. iii) Atrial thrombosis behind the prolapsed cusps. iv) Calcification of the mitral annulus.